Scenario: You need some building or carpentry work done on your property; you want to get a few quotes so you get the best builder for your project. That’s fair – everyone does that. The tradie arrives, ascertains what the issue is and then goes away and emails you through a quote. You’ve asked a builder, a carpenter and a handyman to come and quote. The project involves the construction of a new pergola and deck to come off of it and a few extra bits to tidy the fence up at the same time. The builder and carpenter are both experts in this and come up with a bunch of innovative ideas to improve your idea giving you options on timber types and finishes. Both the Builder and the Carpenter come in with comparable quotes and both are just over $5000+GST. The handyman knows in order to win this work he will need to keep the cost under $3300inc GST so he starts to cut corners suggesting the cheapest timber possible and using low grade steel screws instead of the highest grade screws that cost a lot more but last a lot longer. He says he can get his mate’s son to come and help to reduce the labour costs and he makes it sound like a great deal. 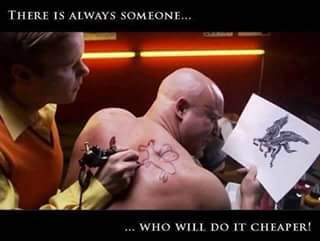 The question is – do you choose the cheap handyman with his mates son and inferior materials to save a few dollars or do you go with the QBCC licenced tradesperson who has years of experience and a trade certificate and Insurance to make the additions to your property. Note: A handyman cannot alter the structural integrity of a building so be very careful what you ask them to do. See what the general public might not know is that the QBCC stipulates that any works over $3300inc GST must be carried out by a licenced builder or carpenter and that includes the materials and labour costs. So the handyman will try and keep his jobs under $3300inc GST, but that doesn’t mean your project is a -$3300inc GST project. Yet it is acceptable to get a Handyman to come in and work on the structural timber works of a building as long as it only costs $3299inc GST all up and their jobs do not touch anything electrical or any of the plumbing works. 1. Did you know that under QBCC legislation the value of building work includes all labour and material costs, regardless of who supplies the materials? So don’t get caught out. Know your legal position because if the works fail at some point in the near future – that Handyman will NOT be licenced, therefore not insured and you will foot the bill for any future works that need to be carried out to fix the problem. 2. You should know that you couldn’t personally do any incidental work that is occupational work, such as plumbing, drainage, pest control or fire protection work, unless you hold the appropriate occupational licence. If you engage another contractor to carry out the occupational work, that contractor must hold an appropriate QBCC occupational contractor licence. So be aware. Work it out and engage the right tradie with the right licences in place to protect your assets and improve your property.